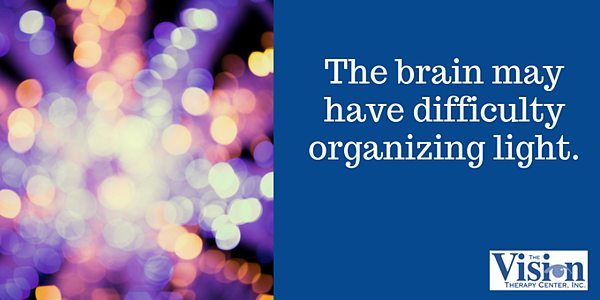 We’re all sensitive to bright lights to some degree. 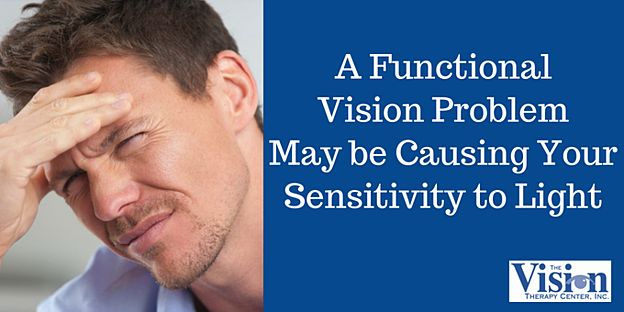 But if you find that your sensitivity is affecting your everyday life, you should consider a vision exam to identify the cause. Photophobia is an extreme sensitivity to or intolerance of light, and it can cause people to avoid sunlight, computers, fluorescent lights and car headlights. It is frequently associated with migraines and dry eye syndrome, can be a side effect of certain medications and can also be a sign of pathology. But it may also be caused by a functional vision problem. Photophobia Symptoms: How do You Know if Your Eyes are Overly Sensitive to Light? Sensitivity to sunlight: You avoid going outside on sunny days. Fluorescent light sensitivity: You can’t work in a room with fluorescent lighting. Sensitivity to car headlights: You won’t drive at night because of headlights. Sensitivity to glare from computer screen: You have more difficulty looking at your computer screen than looking at printed information. Most of these include some sort of injury, infection and/or inflammation. 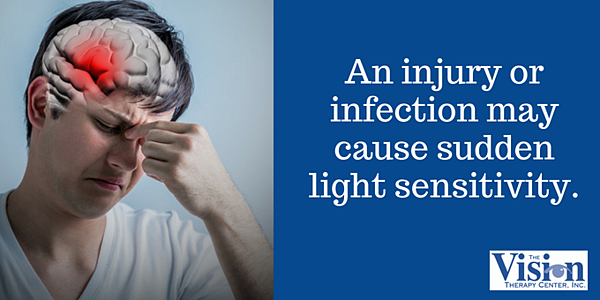 In these types of cases, a person experiences a sudden light sensitivity. The photophobia may be a recent occurrence, and the patient typically does not have any prior experiences. Hello. I am a 34 year old female who is been suffering from photophobia for over 1 year. It began with a muscle spasm above my right eye while doing computer work. This caused excruciating pain for several months along with an inability to look at a television / computer / smart phone screen. I was finally treated by a neuro-opthamologist with botox injections for the muscle spasm pain. 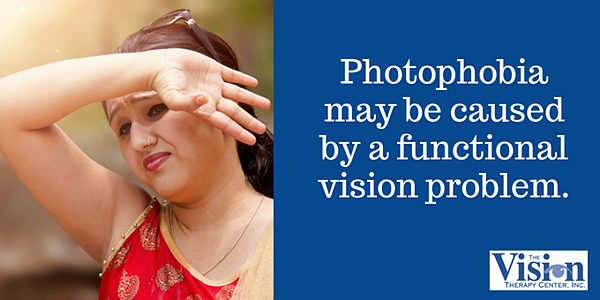 In other cases, the photophobia may be caused by a functional vision problem. “Functional vision” is your ability to interact with your environment using the visual skill areas of eye teaming, eye focusing and eye movements. Photophobia may be experienced by people who have poor eye teaming and focusing problems. One example of a functional vision problem that almost always produces photophobia is exotropia, which is a form of strabismus in which one or both eyes turn out. However, you don’t need to have exotropia to experience photophobia resulting from a functional vision problem. Here is my situation, with photophobia -the sun just completely blinds me and I can't even walk across the street without shielding my eyes. I have a major astigmatism in both eyes, alternating strabismus with exotropia in the left eye (-5.75 vision) and in the right eye, amblyopia (vision >2/400), and it turns in. If you’re suffering from photophobia that has begun recently, it may be linked to causes other than a functional vision problem. However, if your light sensitivity has been ongoing, you should strongly consider having a Functional Vision Exam to determine if it could be treated. Glasses: A pair of glasses prescribed specifically to aid the visual system in the organization of light. Vision therapy: A series of activities and exercises performed under the care of a developmental optometrist and a vision therapist to help improve functional vision. To identify if the cause of photophobia is a functional vision problem, you should have a Functional Vision Exam. This exam includes specialized testing and equipment, and is performed by an optometrist that has had specialized training. Click here to learn more about a Functional Vision Exam and to determine if this is the cause of your photophobia.